The Next Generation Bus Stop. 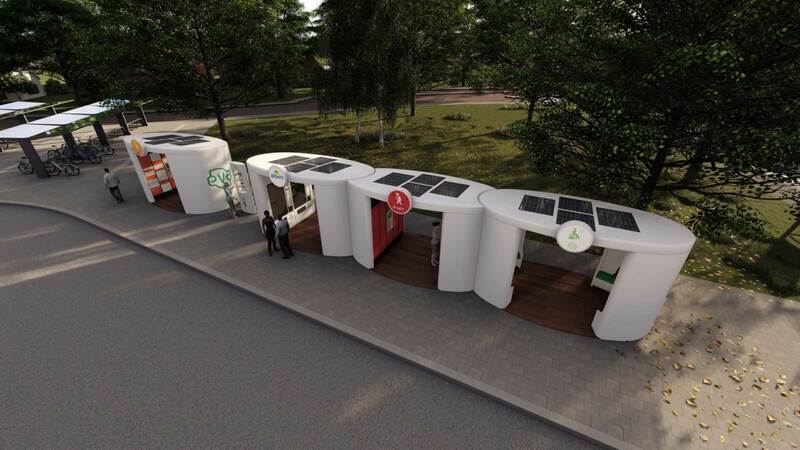 The Nano Hub, is a self-supporting, logistics hub using the bus stop as the central point. 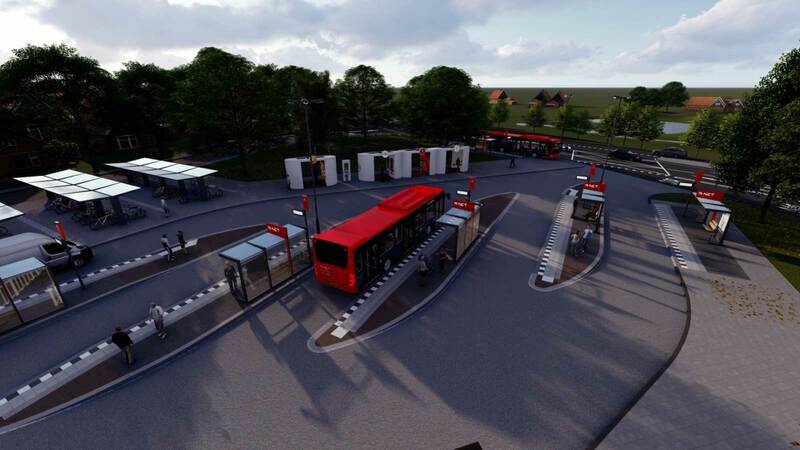 The Nano Hub, is a self-supporting, logistics hub using the bus stop as the central point. Functions of pick up and drop off of humans and goods are combined and are enriched with a number of additional services. It is attractive for residents and travelers since they receive more regional services in one single, central, point. It offers all kind of relevant services executed by partners such as lockers for personal delivery of mail, medicines, internet goods, groceries, etc., bikes, electric bikes, and a car for the last mile. 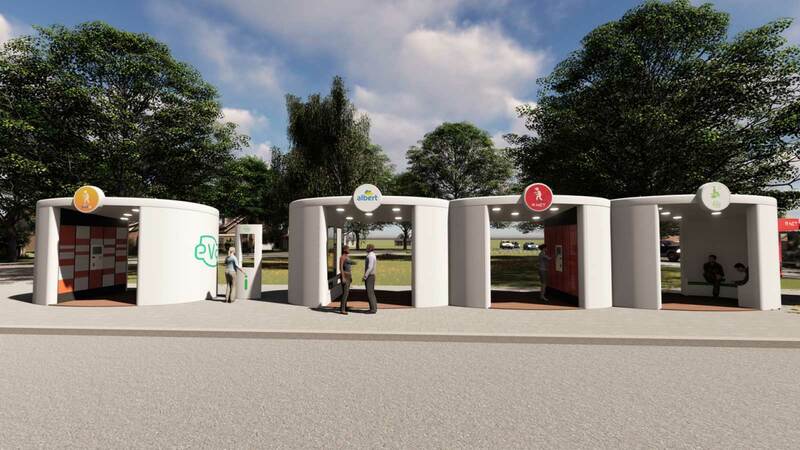 The Bus Stop 2.0 / Nano Hub, having all these combined services, will become a social meeting point in villages and country sides. 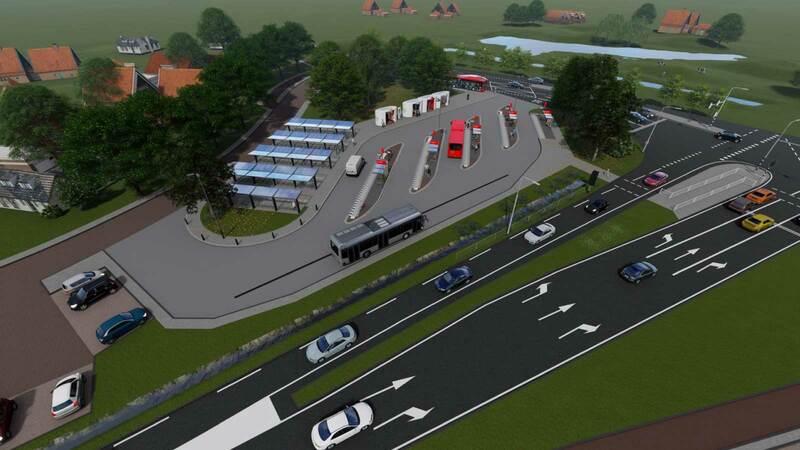 The Bus Stop 2.0 / Nano Hub will optimise the transport chain, by having all in one place. So no package delivery, grocery delivery etc will cross villages for hours and face the fact that people are not at home. This also means less use of logical hardware is required. Logic of people and goods is combined. New business models between partners also contribute to lower costs in the network. The Bus Stop 2.0 has it’s own energy supply by solar panels, so is self supporting. All this combined is very good for the environment, less congestion and particulate matter. The concept was set up from an agile approach, reuse what is there and create new functionalities in what we already have, the smartphone. All applications, as the OV Chipcard and smartphone, can be used to approach the lockers, bicycles and cars. All logistics are combined in one place, no necessity to wait at home for several deliveries on one day. Communication loop is closed, so you are always aware what is waiting for you or when your stuff that needs to be send to others is picked up. Almost to broad to describe, from transportation hub, buses, cars, bicycles all related to humans, to logistics hub, one central point for all delivery and pick up. The logistical site can be fully covered by the buses (separate compartment in back of bus) for delivery and pick up of goods. So no more vehicle driving around from PostNL, DHL, Fedex, AH etc etc, but one bus that already is driving anyway. This will also give the ability to have a better network of buses and transportation in the country side since there is an alternative flow of income next to passengers. Better and more frequent transportation will keep people out of there car use public transportation more often. Scalability is endless, both in number of Bus Stops 2.0, better and more frequent transportation means, better coverage of transportation outside the municipalities etc. and scalability of the service within the Bust Stop 2.0 next to goods, humans and forms of transportation like bus, bicycles and cars. We use an eco friendly and modular building methode. 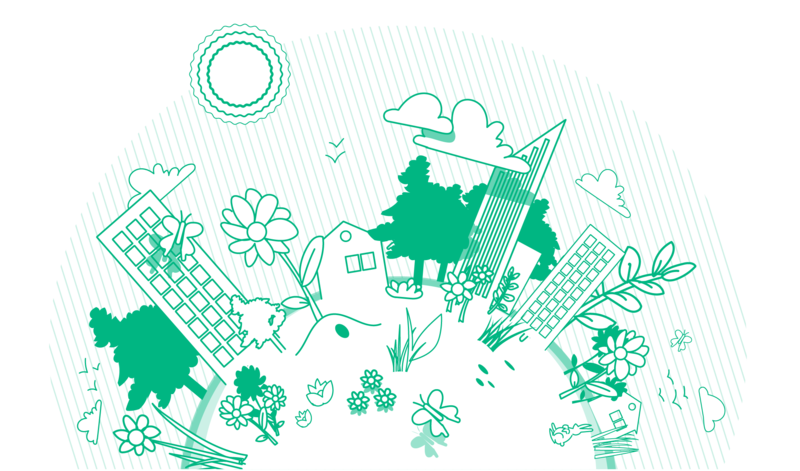 All parts are made from recycled materials. We use 3D printing to produce on demand. Energy wise the Bust Stop 2.0 will be fully self supporting with solar panels and battery packs. We make use of existing tools and techniques, where possible from open source. Stay informed on EVA and Nano Hub, The Next Generation Bus Stop.